Usually when I’m baking something without eggs, I use finely ground flaxseeds as a substitute–like in this bread. These vegan Triple Chocolate Doughnuts use a replacement for eggs that I haven’t tried before: applesauce! In addition to applesauce, bananas, berries, avocado, legumes, and vegetables like zucchini and carrots are some of the whole food swaps made in Emma Hollingsworth’s Vegan Treats: Easy Vegan Bites and Bakes. It’s always disappointing to me when I get a vegan cookbook and the substitutes are all processed plant-based butter, egg, and cheese products; I love that this cookbook shows how to make delicious desserts without the fake stuff. 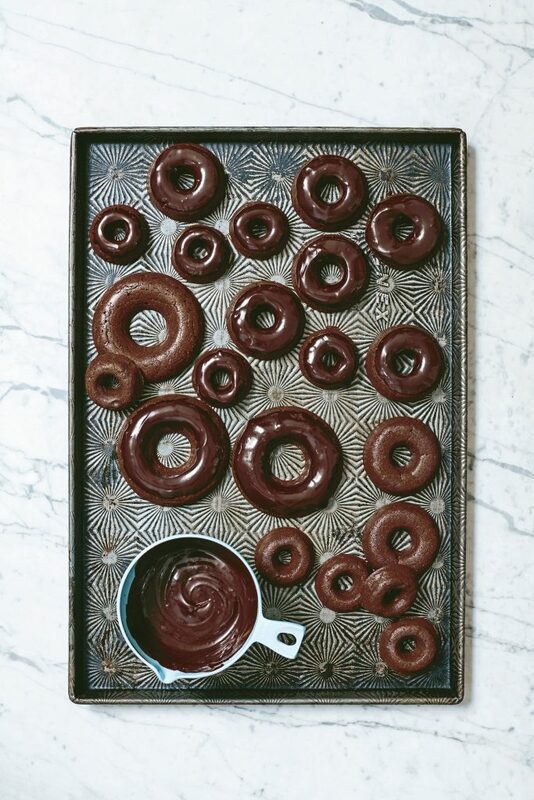 Made with almond meal and buckwheat flour, these Triple Chocolate Doughnuts are naturally gluten-free and they’re sweetened only with the aforementioned applesauce and maple syrup. They’re finished with a maple syrup-sweetened glaze too, giving them a more complex flavor than your typical store-bought glazed doughnuts. You can freeze these vegan doughnuts too–and you’ll kind of want to, because who doesn’t want chocolate doughnuts on hand at all times? Republished with permission from Vegan Treats: Easy Vegan Bites & Bakes by Emma Hollingsworth; Kyle Books. Preheat the oven to 350°F. Grease 8 wells of a doughnut pan (or use a silicone doughnut mold). To make the doughnuts, process all the doughnut ingredients except the chocolate in a food processor until you have a lovely sticky mixture. (If you don’t have a food processor, mix together the ground almonds, buckwheat flour, and cacao powder in a mixing bowl, then mix in the maple syrup, coconut oil, applesauce, salt, and almond milk.) Stir in the chocolate (if using), then divide the mixture among the prepared wells of the pan. Bake for 15 to 20 minutes, until a skewer inserted into the center comes out clean. Let cool while you make the glaze. To make the glaze, combine all the glaze ingredients in a mixing bowl and stir until you have the most decadent and rich chocolate. 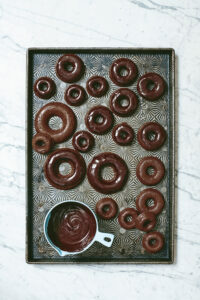 Dunk the tops of the cooled doughnuts, one by one, into the glaze and get ready for a taste sensation! Store in an airtight container for up to a week in the fridge or freeze for 1 month.